A marvellous cask strength bottling of Kilkerran whisky. Kilkerran is owned and operated by the Mitchell family, the same folk who run Springbank. 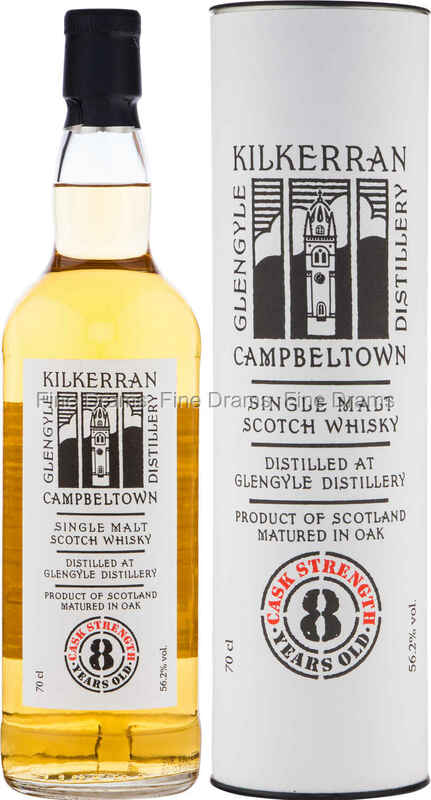 Whilst sold under the name Kilkerran, the company make no secret of the fact that this is distilled at the Glengyle distillery, a recently revived Campbeltown distillery. Here at Fine Drams there are few things we like more than the unique profile of an excellent quality Campbeltown malt whisky, and this is a perfect example. On the nose it opens with a bracing, yet light peat smoke, some puffed rice, powdered white sugar, milk chocolate, maritime mist, green apples and shortcrust pastry. The palate is classic Campbeltown, with rich earthiness and salt, a little sugary sweetness, walnuts, some dense peat and slight vanilla cream. The finish is heavily peaty, with a lasting dry oak and malty toffee flavour. This whisky benefits considerably from the cask strength of 56.2% ABV, and being bottled without chill filtration or colouration. Another brilliant dram from the Mitchells.